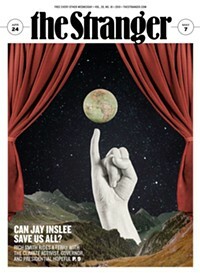 I'm not sure it if was the UN's horrifying new report on how we're all going to die of thirst if we don't stop burning fossil fuels or if it was the Stranger endorsements issue (on stands now! ), but Bill Gates announced this week that he's following in SECB's footsteps in supporting Initiative 1631 in the coming election. Stars! They're just like us. Initiative 1631, as you will learn when you pick up this week's paper (on stands now! ), will, if approved by voters, charge a fee of $15 per metric ton of carbon emissions on carbon emitters beginning in 2020. This fee go to fund clean energy, air, water, and land management projects to the tune of $1 billion each year. Gas prices will go up—which isn't necessarily a bad thing—but I-1631 mandates that 35 percent of the funds raised will be used to offset the cost of the fee in low-income communities, which are hit particularly hard by climate change as well as pollution. Will it hurt the average fossil fuel consumer? Slightly. But not as much as the flood, fires, and droughts that come along with climate change. Besides, you know who doesn't want you to support this initiative? Big Oil. There are three reasons I’m in favor of this initiative. First, passing 1631 would help Washington become a hub for innovative work on clean energy and climate. If you want to be an innovator in this field—whether you want to do academic research, start a company, or both—you will want to do it here. That’s good for everyone in the state and ultimately will foster the companies and industries that will create tens of thousands of jobs in Washington. Can innovators in our state solve this global problem on their own? Of course not. But at a time when Congress isn’t focusing on this issue, states can develop their own ideas and explore what works now. This is an opportunity for Washington to lead the way. Second, putting a price on pollution that causes climate change will create a clear market signal that will help drive adoption of the renewable sources of energy we can deploy today. Given the scale of the problem and the fact that we have at best 50 years to solve it, we need to deploy what we have now—where it’s appropriate—while innovating to find the technology we need for the future. Today, fossil fuels are often cheaper than renewable sources. This initiative will help level the playing field and make renewables more attractive. Finally, 1631 will help the biggest sources of Washington’s clean energy today—nuclear power and hydropower—stay competitive. This is especially important, because nuclear and hydro are cheap and reliable and they don’t contribute to climate change. They will remain part of our clean-energy mix for the foreseeable future. Voters, listen to Bill! Or, if you're more of an Apple guy, listen to SECB.